Monday, 6:00pm - 8:00pm Please call before coming! Thank you! 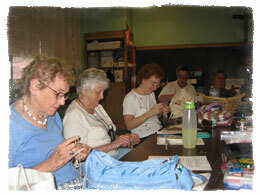 Helping Hands is a social ministry at St. Mary's Parish, for men and women of all ages, to help those less fortunate. 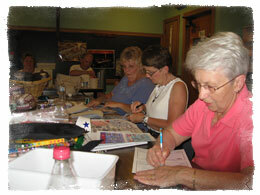 All are cordially invited to join us in St. Pat’s Hall on Saturday, April 27, from 5:30 – 8:00 p.m. to help those in need by cutting coupons for the men and women overseas, decorating cards for the patients at JFK Hospital in Edison and for the homebound through “City Meals on Wheels” or crocheting, knitting or looming scarves for the homeless, baby blankets for Pro Life or lap blankets for local nursing homes and JFK Hospital. † Crochet or knit scarves for the needy as well as crocheting, knitting, and yarn looming baby blankets for Life Choices and lap blankets for residents of various nursing homes. † Cut manufacturers' coupons which will be shipped overseas to various Armed Force locations to help our men and women offset their living expenses. No free coupons or store coupons, only manufacturers' coupons with amounts. New coupon category: health and beauty aid items. We can only use coupons for food items, baby products, animal products and we can now also accept coupons for health and beauty aid items. Please save yourself cutting time (and sorting time for us) and only cut coupons from those four categories. Thank you for your support! Light refreshments will be available. Come for a half hour, hour, or two and use your hands to help. Coupon Cutters for Helping Hands – Reminder! We can only use coupons for food items, baby products and animal products. Please save yourself cutting time (and sorting time for us) and only cut coupons from those three categories. Thank you for your support!